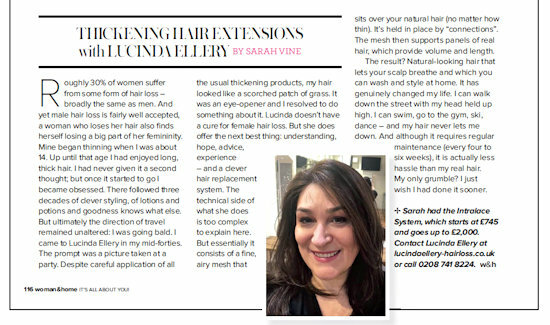 Sarah Vine recounts her problems with thinning hair and the solution she found with our Intralace System. Roughly 30% of women suffer from some form of hair loss – broadly the same as men. And yet male hair loss is fairly well accepted, a woman who loses her hair also finds herself losing a big part of her femininity. Mine began thinning when I was about 14. Up until that age I had enjoyed long, thick hair. I had never given it a second thought; but once it started to go I became obsessed. There followed three decades of clever styling, of lotions and potions and goodness knows what else. But ultimately the direction of travel remained unaltered: I was going bald. I came to Lucinda Ellery in my mid-forties. The prompt was a picture taken at a party. Despite careful application of all the usual thickening products, my hair looked like a scorched patch of grass. It was an eye-opener and I resolved to do something about it. Lucinda doesn’t have a cure for female hair loss. 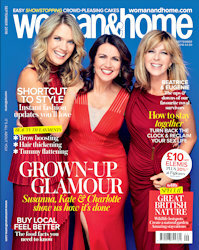 But she does offer the next best thing: understanding, hope, advice, experience – and a clever hair replacement system. The technical side of what she does is too complex to explain here. But essentially it consists of a fine, airy mesh that sits over your natural hair (no matter how thin). It's held in place by "connections". The mesh then supports panels of real hair, which provide volume and length. The result? Natural-looking hair that lets your scalp breathe and which you can wash and style at home. It has genuinely changed my life. I can walk down the street with my head held up high. I can swim, go to the gym, ski, dance – and my hair never lets me down. And although it requires regular maintenance (every four to six weeks), it is actually less hassle than my real hair. My only grumble? I just wish I had done it sooner.